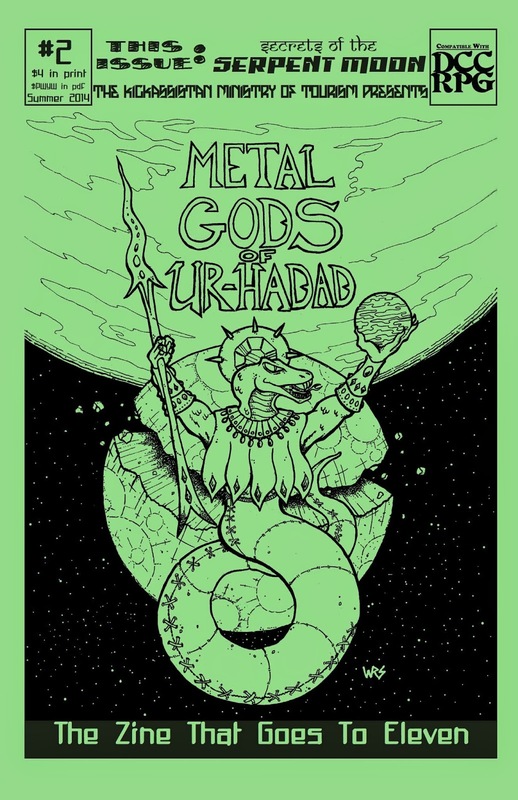 This morning, +Joseph Goodman signed off on the Metal Gods of Ur-Hadad zine, issue #2. I am literally right now waiting for the UPS guy to show up with the first 200 covers for the issue, so I can get started cranking them out. Well, maybe not SO soon. We have a little bit of editing to do on it yet, after which time, we'll be ready for the press. Which brings me to the next topic: release schedule. Since we're in the home stretch, I think it makes sense to explain our release schedule to you, dear reader. We plan on having the issues first available at GenCon. That's right, the first place you can get them will be in Indy, where the fabulous Ms. +Jen Brinkman will be selling it, along with the full compliment of DCC zines [Edit: At the Goodman Games booth; don't bug her when she's not on-duty there, bug me]. In addition, the Metal Gods crew will probably have issues on us to sell after hours and such (if you buy them from us, we promise you'll get a bonus thing of one sort or another), probably at the Embassy Suites during DougKon. We might even have some extra swag if you're interested. At the same time the zine is released at GenCon, I'll start taking orders through Gumroad, which means folks who can't get it at GenCon will still be able to order an early printing. All Gumroad sales automatically include the pdf, so the folks at home will get to peruse that first thing, since they won't be getting their copy of the print zine for a few days. I'll say this right now: I will not be shipping out any zines during GenCon. I'll be in Indy. I don't think they have post offices there. Even if they did, it's not happening until I get back home. So, if you're one of those folks who order early, you'll have your pdf, but please be patient with your print copy. All Metal Gods zine sales through Gumroad are "pay at least," so you'll pay at least $4 (in the US; $4.50 in Canada, $5.50 elsewhere in the world) for the zine, and you can add money beyond that as a donation to the cause that we're championing with that issue. This time around, we're donating to Purple Sorcerer Games in support of their excellent DCC tools that, let's face it, all of us already use. I'll open up PayPal and OneBookShelf (RPGNow/DriveThruRPG) sales the week after GenCon. I can't figure out how to make PayPal let us do a "pay at least" sort of deal, so, if you want to make a donation like the folks using Gumroad, once you buy your print copy of the zine with PayPal, head on over to the OBS site of your choice, where you'll find the pdf version of the zine available as "pay what you want." By this time next week, my lovely wife and I will be on our way to Indianpolis, where we'll be spending a night of calm couplehood before the storm of GenCon strikes. 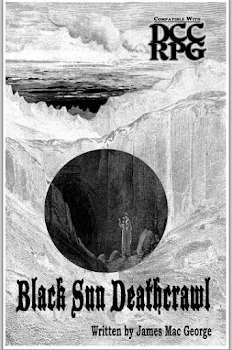 Once it does, the Metal Gods zine will be right there, sailing the frenzied seas of the Best Four Days In Gaming along with everyone else. Metal Gods #2 Now On Sale in Print! Metal Gods & DougKon Swagnado!